The mammalian immune system is a complex but impressive product of evolution. It’s able to defend the body against a wide variety of pathogens, and even to some extent against cancer cells. But to do its job most effectively, the cellular agents of the system need to be trained to distinguish their proper targets from other cells in the body that need to be left alone. Among the cells that need to be left alone are not only all the body’s own cells, which are descendants of a single fertilized egg. There are also about ten times as many bacterial cells in the intestines, which help digest food and cause no problems (as long as they stay in the intestines). But they need to avoid attack from the immune system. How this protection from attack comes about has not been understood. Research just published doesn’t give nearly a complete answer, but does make some significant progress. The immune system’s primary agents for implementing the system’s policies are T cells. Although there are a number of different types of T cells, they can be sorted roughly into two categories: regulatory T cells and effector T cells. The effector cells are the ones that take action against pathogens that they recognize. The regulatory cells can send signals to the effector cells to temper their activity around cells that need to be protected from the immune system. Immature T cells originate in bone marrow. Receptors on their surfaces are able to recognize a vast number of protein antigens. 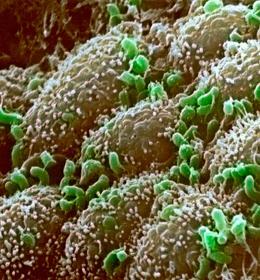 These cells are matured in the thymus. T cells which recognize antigens that identify the body’s own cells mature into regulatory T cells. The rest mature into effector T cells. What the new research has found, in studies on mice, is that regulatory T cells in the intestines also recognize antigens that signify benign intestinal bacteria. Since that could not plausibly have happened in the thymus, it must have occurred in the intestines, where the bacteria are found. But the mechanism behind this is still unknown. Not all foreign particles in the body warrant destruction, however. Microbes living harmlessly, and often helpfully, in the body evade the immune system’s wrath, but researchers don’t know how. Chyi-Song Hsieh of Washington University School of Medicine in St Louis, Missouri, and his colleagues now report that these microbes seem to provide localized instruction in the gut, telling immature T cells that recognize them to develop into regulatory T cells. Previous work had suggested that regulatory T cells could be induced outside the thymus, but this is the first demonstration that such peripherally generated cells actually exist. Potentially lethal strains of influenza wreak havoc indirectly – by overstimulating the immune system to produce a cytokine storm. Such cytokine storms arise from a positive feedback loop in the immune system that gets out of control. Excessive levels of cytokine signaling molecules are produced, causing immune cells such as macrophages and natural killer cells to swarm into the site of infection (the lungs in the case of influenza), producing even more cytokines, and so on. The immune system has mechanisms that normally control this process, but somehow certain strains of influenza – such as the Spanish Influenza of 1918 – apparently interfere with the controls. Now a way has been found that seems to quiet the storm, and it involves cells that aren’t even part of the immune system. Sphingosine-1-phosphate, a signaling molecule that is active in some immune system cells, is triggered by a cell surface receptor, S1P1. It was found that a chemical that binds this receptor (an “agonist“) could prevent cytokine storms in mice infected with influenza. The S1P1 receptor exists on the surface of immune system lymphocytes – but also on the surface of endothelial cells occurring on the inner lining of lymphatic and blood vessels in the lung. Surprisingly enough, it seems that binding S1P1 on the endothelial cells is what calms the cytokine storm, since the S1P1 agonist was effective even in mice that lacked lymphocytes. When the researchers went looking for the cells in the lungs that carry the S1P1 receptor, they found that it occurs on endothelial cells, which line lymphatic and blood vessels, and on the white blood cells known as lymphocytes. That was unexpected because “they are not the cells that are infected by the virus,” Oldstone says. To determine which of these two cell types controls the cytokine surge, the researchers tested the S1P1 receptor activator in mice that lack lymphocytes. The compound also prevented the storms in these animals, suggesting that endothelial cells, not lymphocytes, orchestrate cytokine release. For mice at least, the S1P1 receptor can be a lifesaver. After infecting the rodents with a flu virus isolated from a patient who fell ill during the 2009 swine flu outbreak, Rosen and colleagues dosed some of the animals with a compound that stimulates the receptor. The death rate was 80% in untreated animals buy only 20% in the mice that received the molecule.